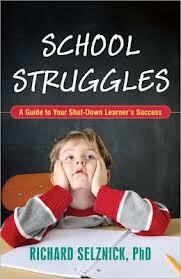 From the Blog at "DrSelz.com"
Generally speaking kids are on one side or the other relative to school issues. I see it all of the time. A parent will say something like, “I have one child who is breezing through school and one that always is struggling.” Basically, there are kids who have a relatively smooth ride, and then there are the rest – the ones on the rougher road. The rougher road kids have a tough time. Your job as a parent is not to necessarily fix the road (probably an impossible task), but to try and help smooth the road out as much as you can. For example, good learning therapy and tutoring will help to fill in some of the holes. Setting up reasonable structures in the house is another example of helping to smooth the road. We seem to like our labels and they have some value, but as a general theme I am generally uncomfortable with labeling and pathologizing children. I see kids more in gradations from the mid- point on a given variable. Dyslexia, for example, is not like a cavity. You can’t put dyslexia on an x-ray and say definitively, “There it is…you have this thing called, dyslexia.” The same is true with ADD/ADHD. Many kids that I see have enough of a “touch” of the syndrome (e.g., ADHD, Reading Disability), yet not enough to warrant full classification or labeling. These children often fall through the cracks. They need help regardless of the label. Parents are blamed for virtually all child issues. I think too much so. Child temperament is a crucial yet underrated variable that accounts for a great deal of the difficulty families’ face with challenging children. Certainly parenting counts and is a big factor, but we tend to see parenting as the be-all and end-all when it comes to child behavior. I can’t understand how parenting is the primary factor when there are two or three children in a family and only one of them is challenging while the other two are flexible and easy-going. Don’t be so quick to take the heat as a parent! Dr. Richard Selznick is a psychologist, nationally certified school psychologist, graduate school professor, university professor of pediatrics and school consultant. The author of two books, The Shut-Down Learner: Helping Your Academically Discouraged Child and the recently published School Struggles: A Guide To Your Shut-Down Learner’s Success, he has presented to parents and educators internationally, as far as Dubai and Abu Dhabi and throughout the United States. A presenter who discusses difficult topics without jargon, he addresses complex issues in down-to earth terms.